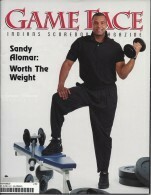 On the 1996 June Cleveland Indians program, Sandy Alomar Jr. is on the cover. Since Sandy Alomar Jr. is on the cover of this issue. This Cleveland Indians program covers Sandy Alomar Jr. as the feature article that is seven pages with a two page picture of him in catcher gear. 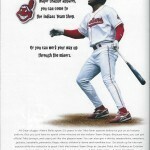 There is also an interesting Indians Team shop ad with Albert Belle in it. Albert Belle was not a fan friendly player but the team shop was using him since he came out of the Cleveland Indians Farm system. 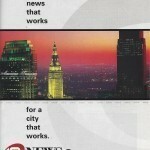 There is also an awesome picture of downtown Cleveland at dusk in a Channel 19 news ad. Check this neat picture of downtown Cleveland at night! How collectible is the 1996 June Cleveland Indians Program? This program is not highly sought after but it is affordable for all types of collectors. If you are a Sandy Alomar Jr. or Cleveland Indians fan then is a must have issue. The 90s Cleveland Indians teams were one of the best teams since the 40s and 50s Cleveland Indians teams. There also might be Cleveland Indians collectors who collect 90s memorabilia.